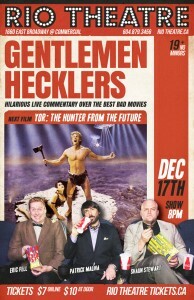 Here’s a special thank you to all the fans of The Critical Hit show: a 2-for 1 deal for The Gentlemen Hecklers! The Critical Hit Show’s Eric Fell and Shaun Stewart are once again joined by Patrick Maliha to provide hilarious live commentary for the Best Bad Movies! This time we take on “Yor, the Hunter from the Future” starring Reb Brown! Here’s how you get the 2-for-1 deal: When you go to the Rio Theatre Box Office to buy your ticket, and you show them a twenty-sided die, your “Admit One” becomes an “An Admit Two!” It’s that simple. Ten bucks gets you two admissions as long as you have that D20 with you.